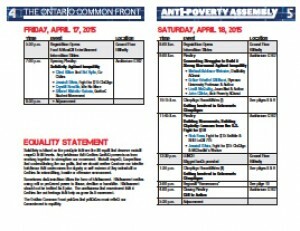 Ontario remains a wealthy province inflicted with the disease of poverty. The only way to reverse the trend towards greater inequality is through broad and diverse organizing to demand meaningful change at every level. 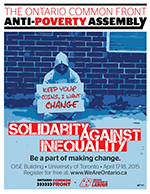 The Ontario Common Front and the Ontario Federation of Labour are calling on you to join students, workers, retirees and community and anti-poverty activists at an Anti-Poverty Assembly on April 17 and 18 at the University of Toronto. Together, we will draft, develop and launch a “Solidarity Against Inequality” campaign, designed to put pressure on the governments of Ontario and Canada to take meaningful and immediate action to end poverty in all of its forms. Scroll down to REGISTER ONLINE NOW and keep scrolling to see a lit of endorsing organizations. Click here to download the full call-out, registration form and promotional poster. Attendance at this assembly is FREE, so register online below to be a part of making change! Fill out this online form to register for free.